Today we had a spontaneous visit from a wonderful man called John Palmer, who is famous in our valley for his knowledge of the environment, native plants, weeds and sustainable living. “We’re going to make you a garden bed”, he announced with a big grin on his weathered face. “But we don’t have any soil or mulch or anything!” I replied. “You don’t need it – we’re just going to use what’s around you! You’ve got tons of beautiful mulch over there – just waiting to be harvested!” Kosuke and I both looked at him with surprise and some disbelief. John proceeded to show us how to “sheet mulch”. We laid cardboard and newspapers down over a grassy/weedy area alongside our front path. I pointed to the remains of some mulch that we had leftover from our only (unsuccessful) attempt at making a garden bed – “Shall I cart that over?” “Nah! We’re going to use something much better than that and the best thing is, you don’t have to go out in your car to buy it! This is what real sustainability is about. You live in a great environment to really use what’s around you. You shouldn’t have to stray far from your local area – it’s all here. John then pulled a rusty scythe from his jeep and marched over to the overgrown border between the Ecovillage and the neighbouring farm. There was a type of grass growing there (pasapalum) – huge amounts of it – that he said makes the best straw mulch. It’s a pesky weed, he explained, but a great mulch – it’s already seeded so it won’t seed in your garden bed. “So, you’re doing the Ecovillage a favour by cleaning up their boundaries and at the same time, you’re getting free mulch that’s much better than that woodchip stuff!” He puffed, as he swung his scythe back and forth in rhythmic motion while I admired all the rippling muscles in his torso. Who needs to go the gym when you use traditional non-petrol based tools? We gathered the grass up in our arms and pretty soon, we had the whole bed covered. We then bordered it with some basalt rocks we had lying around. I still couldn’t see how we would plant anything in it – all I could see was a pile of cardboard and newspaper covered in cut grass. 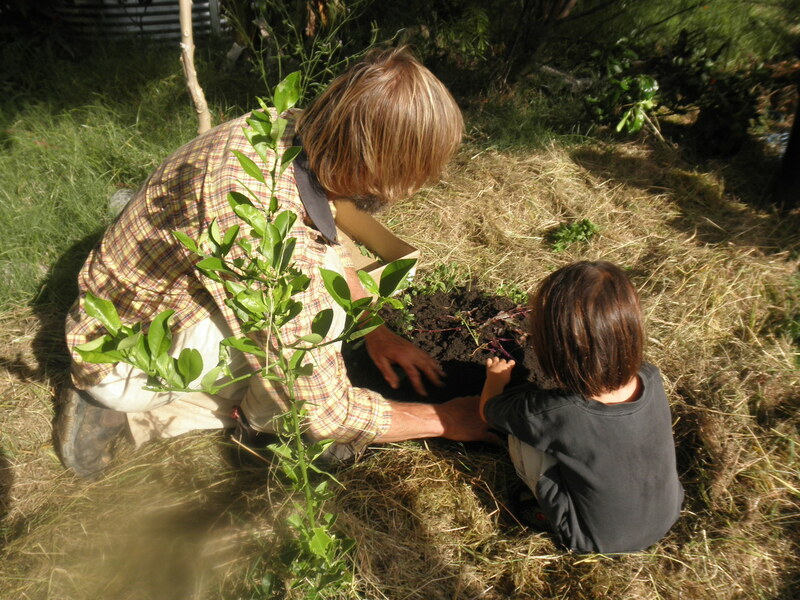 “Now, we’re going to plant one little garden”, he announced, “just to show you how it’s done. So we need some soil”. I looked around at our boggy clay garden. “I’ve got some potting mix in the car. Shall I get that?”. “No, we’re going to source it from your local surroundings! !” and again, he marched off to the nearby boundary. There we found some sawn logs and old tree roots that had been left to break down. He pulled one out of the way. “Aahh, see that!” he sighed with satisfaction as he dug his hands into the rich soil. “And look at that! earthworms! !” he said. Then he dug the soil up with his bare hands and put it into his bucket. On the way back, John caught sight of some lumps of kangaroo poo (of which there is always plenty lying around!). “Ahh, the best manure! !” he exclaimed as he bent down to pick it up (with his bare hands) and put it in the bucket. “See, it’s all around you. Use what’s here. You shouldn’t have to rely on petrol to make your garden”. He grabbed some dried lawn clippings as well. “This makes good mulch too”. Back at the mulch bed, we tipped the soil into a pile with the roo poo at the bottom. I dropped the tomatoes on top. “Nah, you’ve got to liberate the seeds!” he showed me how to squish the seeds out and spread them around. Then we put the legume mulch and the dried grass on top. “Hopefully the grass will disguise this little garden from the chooks” (who’d been freely roaming and destroying our attempts at creating garden). And there it was! So easy. A garden bed that we’d been procrastinating about because of lack of money to buy soil and mulch and the effort of having to borrow a trailer, attach it to the car and go and buy loads of soil which then needs shovelling. ← How can I use herbs in my daily life?